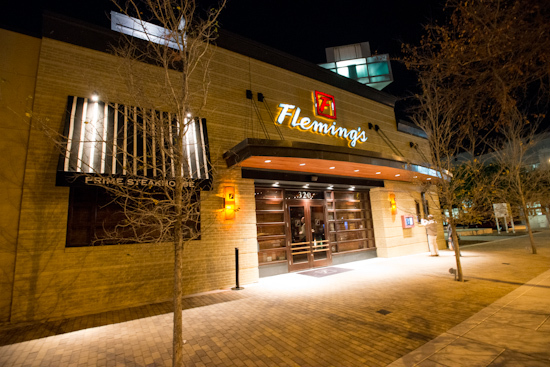 At the beginning of October 2013, I received an invitation to attend a dinner at Fleming's to preview their new menu. With a new baby and my work schedule, I wasn't able to make it, so I didn't participate. At the end of October, the menu revamp was launched nationwide at all Fleming's locations. A couple weeks later, Fleming's reached out again to see if I was interested in tasting some of the new menu items. I wasn't able to get the time to work until the first week of January, but we managed to get the dinner arranged and set up at the Fleming's in Austin, Texas (downtown location near the convention center). Unfortunately, I had never eaten at a Fleming's before, so I couldn't compare the new menu to the old with this visit. 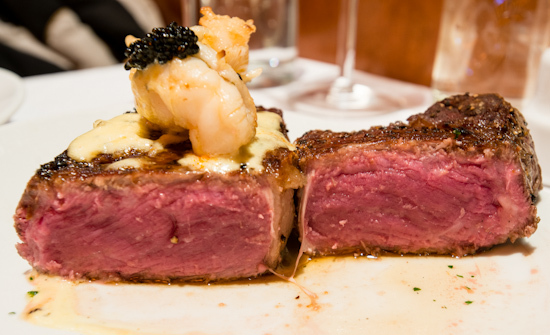 In fact, I knew very little about Fleming's and what little I had heard about them over the years led me to believe the steakhouse was expensive, boring, and mediocre. After dining there, I have to say I was quite surprised with the experience and truly enjoyed my dinner. Instead of ordering off the menu, I asked them to put together a dinner for us that showcased the items they wanted us to taste. A wedge salad was brought out and my heart sank. This was one of the new and exciting items they wanted to show me? Oh well. I cut into the iceberg lettuce, tossed it lightly in the blue cheese dressing and took a bite. The lettuce was fresh and the crunch was refreshing even on a cold night (it was just above freezing that night). The dressing was smooth and perfect - with a very mild blue cheese flavor that doesn't overwhelm but flavorful enough to season the lettuce and change what is normally a bland salad into something very tasty. The bacon and blue cheese slab that accompanied the salad was also a delicious addition. In many ways, this dish was the perfect example of my dining experience - it sounded like it would be boring and bland, but turned out to be well executed and tasty. 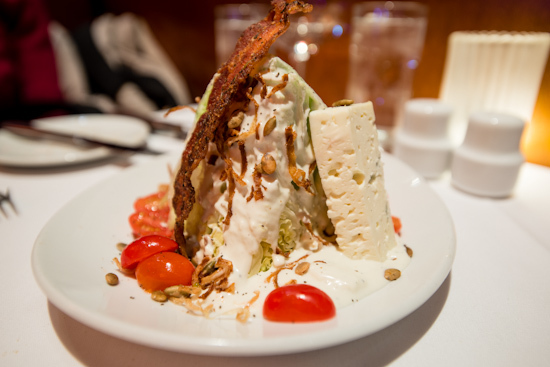 The New Wedge Salad ($9.50). I also had the Heirloom Tomato & Housemade Burrata Salad ($9.95) which comes with red and golden beets, arugula, and a lemon-pistachio vinaigrette. I'm a big fan of burrata (a mozzarella pouch filled with a smooth blend of mozzarella and cream), but this burrata was different than what I was used to getting. There was no outer shell of mozzarella and the cream and mozzarella blend wasn't smooth and velvety. 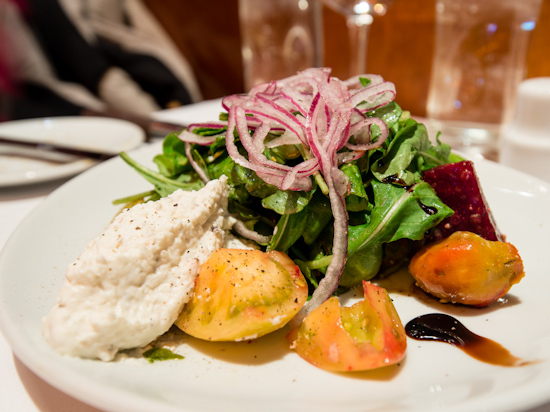 Instead, it was blended so the texture was similar to that of a fine ricotta cheese providing the flavor of burrata but with a texture and consistency that works better in a salad and a traditional burrata would. As a fan of beets, burrata, and arugula, I enjoyed this salad, but was surprised that I preferred the wedge salad with it's mild blue cheese dressing. Both salads were flavorful, but neither one was overly salty. 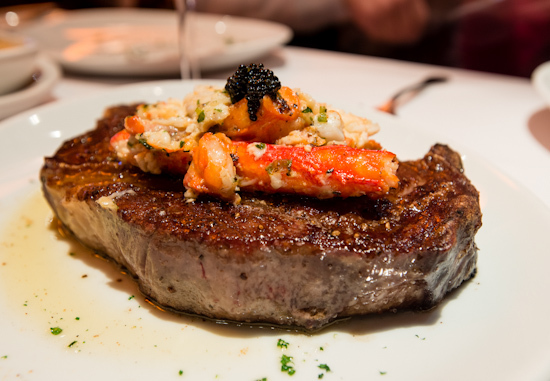 Our first steak was the iron-crusted Dry-Aged Prime Ribeye ($53.50) with King Crab With Herb Butter Companion ($11.95). Apparently, Fleming's used to only serve wet-aged steak (where the beef is aged while in a cryovac bag [like supermarket beef] for 21 days). 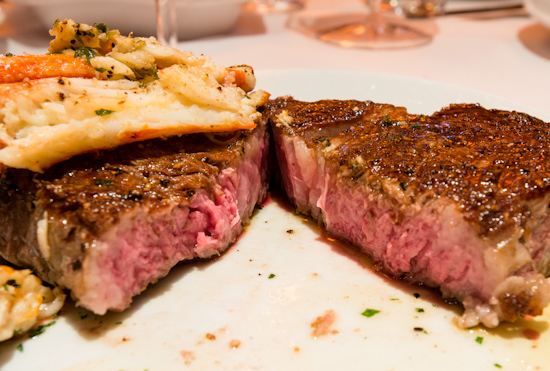 Their new menu introduces two dry-aged steaks: the ribeye and the new york strip. Since dry-aging results in better flavor and texture, I was surprised that they didn't have dry-aged steaks previously. The ribeye steak was ordered medium-rare and came medium-rare. The steak needed no sauce or other seasoning (good steak doesn't need anything else unless someone messed up), but I have to say that the crab does enhance the beef and lets you vary the flavors between bites. The best part of the steak was the iron-crust which apparently is an extra step where the steak is extra seared on cast iron giving it a thin crunchy crust that remained crunchy even through the last bite. I have to say, it's the best crust I've had on a steak in perhaps five years. 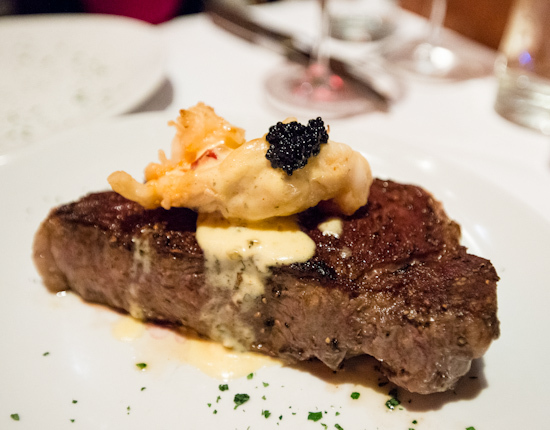 The other steak was a Dry-Aged New York Strip ($54.95) with Truffled Poached Lobster Companion ($12.50). This one had their "normal" crust achieved by broiling at 1600 degrees. The lobster was tender and also worked well as a companion, but I preferred the sweet and saltiness of the king crab. The New York strip was ordered medium-rare and came rare. This worked out well for me since I prefer my strip steaks to be rare (and I do believe it's better for a steakhouse to err on the cooler side than overcooking), but I was surprised that the steak didn't come as ordered. Since I prefer this cut rare anyway, I didn't send it back to get fixed, but I did mention it to our server so the kitchen would know. 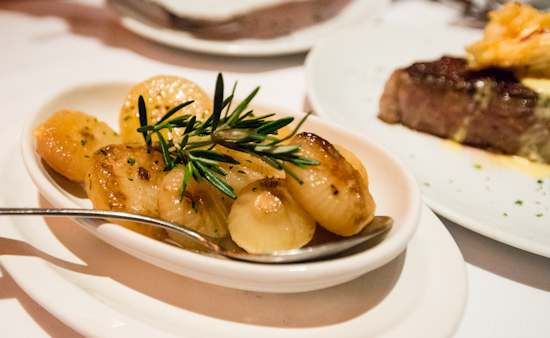 We tried the Rosemary & Garlic Cipollini Onions ($8.50) as a side which was well prepared and worked well with the steaks. 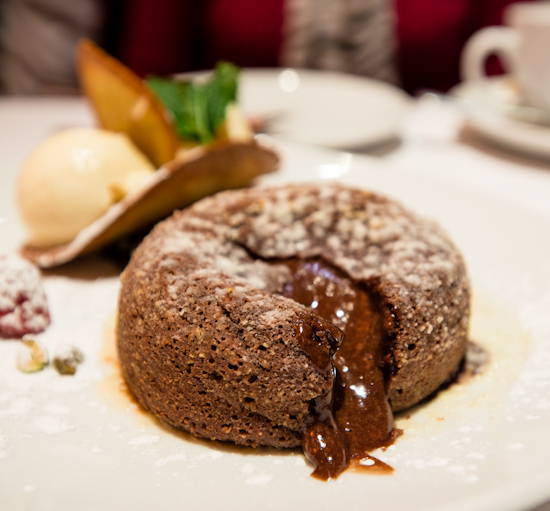 Dessert was not a new item - Chocolate Lava Cake ($12.50). 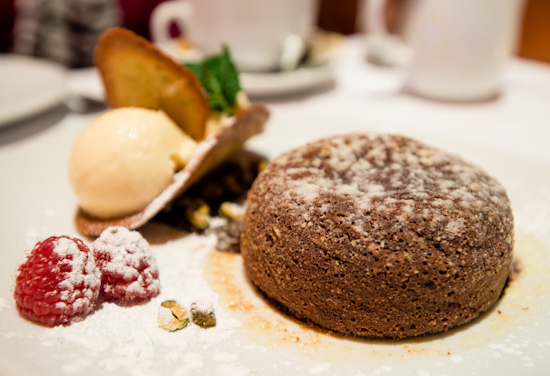 Chocolate Lava Cake feels dated - like a dessert from the nineties - but when it works, it works. This one was tasty, flowed nicely, and was actually quite a good way to end the meal. I guess that's why it's so commonly found on the dessert menus of steakhouses. In this case, it was rich without feeling heavy and nicely executed. As I mentioned before, I was pleasantly surprised by my dinner at Fleming's and found the steaks (especially the iron-crusted dry-aged rib eye) recommendation worthy. I plan on going back and taking Tina once our daughter has weaned and we get a sitter.